The idea came from the fact that it’s quite windy here in Edinburgh. When I am looking at the trees waving their branches, I feel like they are dancing. Nature is full of movements and changing. It could be interesting to recreate the dynamic facts into a piece of picture or music. Imagine that we put sensors like accelerator or gyroscope on the branches of a tree, and then record the movements with time passing. Send the data back to the computer and apply functions to it to generate lines, circles and polygons in different sizes and colours. Thus, the movements of branches could be visualised into a piece of abstract random picture. The similar as making a piece of music or we may mix the picture and music together. In this project, we do a job of drawing(designing) according to the realtime data, which is about the environment(wind, gravity), plant itself(spring, growth) and the time. Hamer is both an artist and a scientist. He showed us his wonderful work during the lecture, which made me believe that science can reveal its beauty in form of the art. This is a demo I played on TEI conference this February. People draw by their sounds, making the invisible volume into visible lines. The Brain Trilogy is a live experiment in time, space and sound by Glasgow-based Wiretrace. Interactive 3D stereo, mapped projections and live audio mixing enable the viewer to experience an ever-changing immersive experience.The work, inspired by neurologists from the Open University, seeks to recreate the beautiful and subtle morphology of the brain and ask fundamental questions as to the physical nature of memory and inner personal reality. Human dancing has already been tried turning into drawing. Following video shows Anne Teresa De Keersmaeker performing On Line. Unlike common paintings which are done by strokes after strokes, generative art works are done by mathematics. They looked random but have something profound. 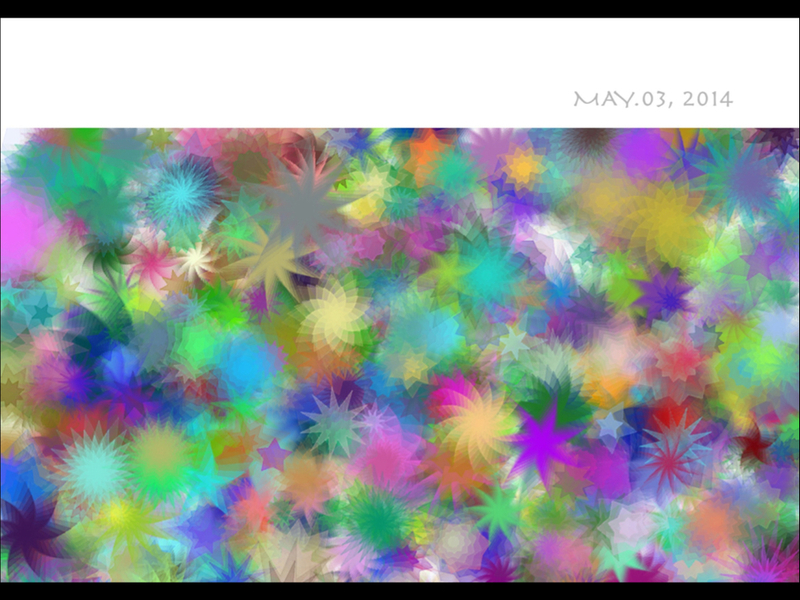 I started by learning the generative art. I read these two books, learnt the examples and run the demos. Then I tested the first work, My Star Mandala. I tried to use the data getting from the sensors to control the parameters, such as using the y-asix acceleration to control the outer radius of the single mandala; the bigger the y-asix acceleration, the smaller the outer radius. Similarly, the bigger x-asix acceleration, the larger the steps(steps decide how many stars to draw). However, as pointed by Duncan, these kind of work cannot tell more informations. For example, how would people know the painting was drawn by what kind of plants? How strong is the wind? Where to see the time?…It would be better if take timing into account. So I started thinking about the dynamic facts among the movements of branches. It wasn't an easy work, because the data captured by sensor only reflect the acceleration of a certain point. Since at least three forces are acted on this point - wind, gravity, plant itself, the data cannot indicate how strong the wind is. I read another book, The Nature of Code. I realised that I still can do something with that certain point. Because the acceleration, velocity and location of this point have meanings. Since the processing module will update every tiny time slot, it is reasonable to do the vector operations between acceleration, velocity and location. I used the starting position and the new positions of the certain point where sensor located to draw lines, I named it 'Wind Pen'. Through this picture, we can see the collection of the locations of one point on this tree's one branch. It went farthest in the direction of top-right, which indicates that it has been blowed to that far in a certain direction, compared with other directions. Another information is it has been blowed to bottom-right most, although not very far in distance. Tree painting is not that easy. The painting drawn by trees could be attractive to some people. We can use the wonderful pieces of works to make postcards, bags, cloths and mug. Or we can develop an app or game where people can choose their favourite pen styles, loved plants and preferred time, even they can create their own drawing methods. Also, it would be a good idea to migrate these to sounds. After the above practice, I think the most exciting part of this project is the beauty of unpredictable; it is hard to tell what will happen on the canvas, although the established rules has been applied. The trajectories of the plants disappear immediately, they create the art written in water. Not everybody has feelings of these masterpieces of nature, but we still have reason to recreate the immateriality into materiality. I believe this is an potential project, what I have done is just a beginning on the first stage. I will do more in the coming summer to make it better. I present the project on May.9th in the RBGE. There I got good suggestions. Duncan suggested that more sensors could be put on the different sides of the trees, and then reveal the data in 3D way. It is a good idea which corresponding the fact that the plants are 3D. Chris pointed out that I have made data into many graphic results, it might be interesting to reveal the data into different forms of art. How long would it take to finish one piece of work? Jon asked this question. It depends on the parameters I set and how windy the day is. A watchable piece of work could be done within ten minutes, half an hour or the whole day. Also Young asked how could I know when the wind come? The answer is I just wait under the tree. So when it wasn't a windy day, I got nothing back to home. However, a blank canvas with tiny strokes has the meaning of a not windy moment during such situation.